Merry kisses my crafty friend! 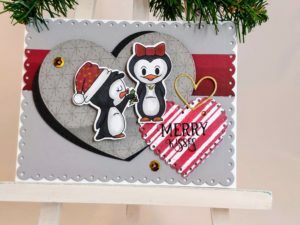 Today I’m showing off another Christmas card made using the adorable Merry Kisses digi-stamps from Heartcraft Paper. I just love these cutie pies! And I’ll show you a cool technique to make computer printed sentiments stand out and feel like they are hand stamped. 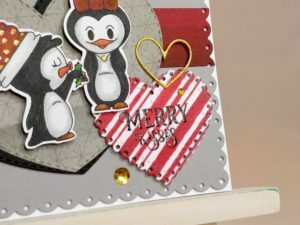 For this card, I sized my digi-stamp penguins to be about 2″ tall so they’d fill up a lot of the space on my card front. I also sized my sentiment to fit on a 2″ scalloped heart shaped die, then I printed them on cardstock. I colored the penguins with alcohol markers and cut them out with my ScanNCut. I like to die cut all of my pieces before I get too far with a card; it makes assembly faster. I used my Big Shot to cut out a grey scalloped rectangle, a smaller strip of red with the same scalloped rectangle (so the edges would match up), two large stitched hearts (one from grey pattern paper and one from black), and a gold heart outline. I also centered the scalloped heart die over my sentiment and cut it out too. To dress up the sentiment, I used a VersaMarker pen to trace and then heat embossed it with clear embossing powder to give the text a raised, shiny feel. 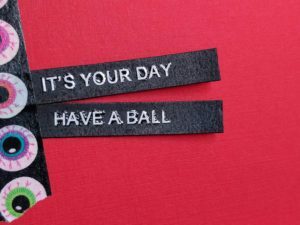 This technique can be used to accentuate any computer printed sentiment or digi-stamp and help it stand out more. I wanted a little color on my sentiment so I stenciled on two shades of red Distress Oxide ink to match the reds on my penguins. Before assembling my card, I used the darker shades of red alcohol markers that I colored my penguins with, to shade the bottom of the red strip of cardstock. I lightly sponged black soot Distress Oxide ink over a hillside stencil at the bottom of the grey pattern paper heart to create a ground for my penguins, then I outlined the heart with clear Wink of Stella. 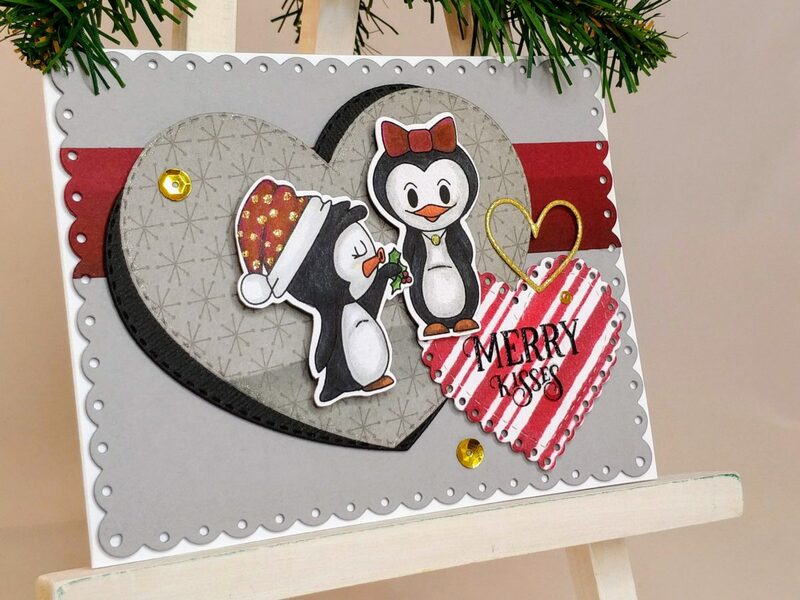 I also used my VersaMarker again to add gold sparkle embossing powder on the diecut heart outline, the penguin’s necklace and polka dots on the other penguin’s hat. Then I used glue and foam tape to adhere everything to a white A2 card base. I finished it off with a few gold sequins. Pretty cute, right? Want to see more projects featuring these cute digi-stamps from Heartcraft Paper? Check out Cheerful Christmas Penguins and Misty the Spinning Penguin!